In order to get accepted into some of the country’s top pathology residency programs, aspiring students have to impress the pathology residency admissions boards in a number of ways. Not only do students need to have an impressive academic record and have proven the success of their ability to succeed academically, but they need to impress pathology residency programs with their application package and writing personal statement for residency is a crucial part of it. In this package students will need to include a number of things, they will not only need to fill out the necessary forms and show their transcripts but they will need to have a pathology residency personal statement that sticks out and will get them noticed by the admissions boards. The best pathology residency programs in the country will look for students who are well-rounded individuals and who can prove that they deserve a spot in one of these highly competitive programs. Since admissions boards have so many applicants to look through, the best way to do this is by submitting a well-written and engaging personal statement to accompany your application. The right personal statement can be your key to getting admitted into the program of your choice. This is why we offer high-quality pathology residency personal statement services specifically to help students applying to these programs get quality personal statements that will raise their chances of acceptance. What Pathology Residency Programs Should You Apply To? University of California San Francisco: the campus is fully dedicated to health science and offers a 4 year course of study across 4 hospitals. University of Vermont: ranked 29th overall for medicine the program offers one of the best pathology 4 year residencies that you can apply to. University of Pennsylvania: you can choose from a 3 year anatomic pathology program or a AP/CP program lasting for 4 years. Columbia University: has a faculty of 144 members along with some 19 fellows and 23 residents at any time. It also has excellent funding for research. Michigan State University: this program benefits from having not one but three on campus medical schools for you to train within. Rochester University: Proud of their academic excellence this program works within laboratories that process over 2 million samples each year. What Should Be Written About in Your Pathology Residency Personal Statement? Why do you want to follow a career in pathology? What studies and other work have you undertaken in this area? What makes you particularly suited to work in this specialty? What is your proposed career path? Why did you apply to this specific pathology residency? This is not an opportunity to complain about past programs or tutors. It is not a place to make excuses for any problems in the past. You should not be repeating information that is already included elsewhere in your application. You should not be talking about anything that is simply not relevant to your application. Since most programs have so many deserving applicants each with an impressive grade point average, they need to have something that will help them differentiate students from one another; this is what the personal statement does. With so much emphasis placed on the personal statement, it is important that students have the right type of help with this task. You wouldn’t want just any individual helping you create one of the most important essays you will ever write, which is why we staff professional writers on our team that will not only create professional-grade statements for you but understand the pathology residency application program. How Should You Write Your Personal Statement for Pathology Residency? Always research the program you are applying to and reflect their particular expectations clearly within your personal statement. Open with a hook, your first line must be unique and able to get their full attention. Make them want to read more to discover what you are going to have to say. Tell a story: use an anecdote to form your statement around so that you can provide the reader with a clear flow as well as keeping them glued to what you will say. Use language that all can understand, never use slang or acronyms and don’t try to be clever by selecting unusual words from your thesaurus. Revise and proofread your writing: you must ensure that your writing will impress the reader fully and that there are no issues with it at all. When you turn to our professional residency personal statement writing services for help creating your personal statement, you aren’t only getting the help of an experienced writer but you will also be getting quality customer service. Our representatives are here to make sure all of your questions are answered and that you are completely satisfied with your person statement. 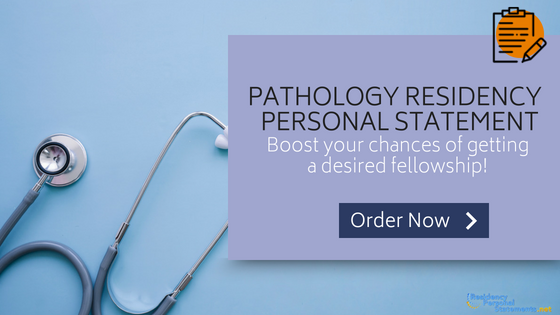 Submit a pathology residency personal statement with your application that will get you ranked for the Match with our specialized and effective writing services.